1924: A steel lookout tower was erected. June 29, 1922: "Maine and New Hampshire are going to join drives in looking for forest fires. It appears that Maine has been maintaining a lookout tower on Cedar Mountain in the town of Parsonsfield. This mountain is not very high and the view is limited. It is now proposed to move the tower to the summit of Green Mountain just across the line in New Hampshire. This is more of an upheaval and commands a view clear through to the coast. Both states will be benefited by the change. It was first suggested that the present tower be retained on Cedar Mountain, but this plan will be abandoned. The tower will be removed. New Hampshire will pay the expense of removal, purchase 200 acres of land for the warden's camp and build one and a half miles of forest telephone. Green Mountain is some 800 feet higher than Cedar Mountain. The maintenance of the station will be jointly by the two states, and Maine, by this plan, will save $200 annually. 1918: The construction of the tower was not completed. 1919: "On May 25th we started up to build the Center Mountain lookout. This had been hauled up to the foot of the mountain the year before on a hand sled. The steel house and cement was hauled up to the top of the mountain by the Lincoln Pulpwood Company's team and men, and the Forestry Department paid for the same. Owing to the mountain being so steep, it was a hard job to get it up to the top. By June 15th we had the tower up, the telephone installed and everything in running order. A cabin was built last year. 1920: Inventory shows a 12-foot steel tower. 1920: Inventory indicates a 12-foot steel tower. 1920: Inventory shows a 48-foot wood tower. 1919: "A good trail has been cleared out from the foot of DeBoulie Mountain to the top, where the watchman had a temporary lookout in the trees, which answered the purpose very well for this year. 'I built a telephone line from Birch River Dam patrol camp to DeBoullie Mountain (1919 season), a distance of eight miles, and connected this line direct into Eagle Lake central office, a distance of one and one-half miles, to connect the Whitman camps onto this line and installed a telephone in the camps which are situated at Island Pond Range 15, making the total length of this line about (?) miles. 'I built a temporary cabin at the foot of DeBoullie Mountain on the shores of DeBoullie Lake, for the watchman to live in, covered it with bark and installed a telephone therein, I would suggest building a larger camp there and cover it with shingles so as to store the canoe, fire fighting utensils, etc., at the close of the season. 1937: The lookout was struck by lightning and destroyed. A replacement tower was immediately constructed. 1913: This site was established as a lookout station. 1918: The construction of the tower completed. 1920: Inventory shows a 24-foot steel tower. 1920: Inventory shows a 48-foot steel tower. 1913: This site was established as a lookout, two fires reported from this station. 1920: Inventory shows a 60-foot steel tower. 1920: Inventory show a 24-foot steel tower. 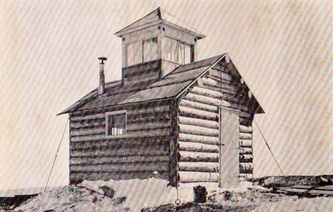 1914: A lookout station was established. August 17, 1989: "The first of what are to become annual community improvement projects by the Wheelabrator Environmental Systems Co. recently resulted in the restoration of a Maine Forest Service fire tower on Horse Mountain in Baxter State Park in Township 6, Range 8. A six-man volunteer crew was flown to the mountain Saturday, July 22, in a Maine Forest Service helicopter. The men, all employees of the company, spent eight hours at the mountain installing new windows, putting on a new roof, installing a new floor and painting the steel tower and woodwork at the tower. 1917: A 64-foot steel tower was erected. "The tower on Kineo Mountain was erected in conjunction with the Kennebec Valley Protective Association, Maine Central Railroad Company, and Ricker Hotel Company. April 12, 1918: "Miss Alice Henderson of Gardiner, Kennebec county, Maine, will be the first woman watcher in a fire lookout station in New England, although there are a few in the federal preserves in the west, when she begins her duties next month at the federal station at Mt. Kineo, Moosehead Lake. For several months Miss Henderson, who is 21 years of age and weighs 130 pounds, will live all alone in that watch tower on top of Mt. Kineo, two and one-half miles from Mt. Kineo House. The federal authorities have consented that a woman be employed in this watch tower. 'I can do the work as well as any man,' said Miss Henderson to Forest H. Colby of Bingham, the Maine land agent and forest commissioner, when she applied for the position. She is fairly well acquainted with the Moosehead Lake territory and is a great lover of woods. If the season should be particularly dry, another young woman may accompany her. She worked for two summers in sporting camps in the Moosehead lake region. 1920: Inventory shows a 64-foot steel tower. July 25, 1983: "The restoration of Little's Mountain tower by Maine Forest Service this summer marked the second time in 20 years that the structure was refurbished to serve as a fire-lookout station in eastern Washington County. Forest rangers built new wooden stairs to reach the tower house and planned to replace glass windows in the lookout with plexiglass panels this month. Even before repairs were completed, a lookout was stationed in the tower to watch over the forests, where an extreme fire hazard had existed for several weeks earlier this summer. Little's Mountain tower was used every summer until 1972, when veteran watchman Guy Cook of Dennysville retired. Then, the duty of fire spotting was taken over by pilots, who were assigned to make surveillance flights over the country several times a day. The lookout tower, located in Cobscook State Park, was abandoned and allowed to fall to pieces during the next 11 years. Only when the softwood forests began dying because of wide spread spruce-budworm infestation did the Forest Service take a second look at the tower on Little's Mountain. In August 1963, when Little's Mountain was a key location in the county's network of forest-fire lookouts, rangers made significant changes to the tower. The main problem was that the 32-foot tower did not provide a clear view above the surrounding trees. Faced with an alternative of extending the tower above the trees or building a new tower at an estimated cost of $10,000, the Forest Service extended the old tower 28 feet by building a new structure right over the old one. A work crew that included Fire Wardens George Hill and Edward Grant. Forest Patrolman Clyde Madison and Cook took down a radio tower located on the Edmonds branch of the Moosehorn Game and Wildlife Preserve and reassembled the structure over the old wooden tower on Little's Mountain. The new tower, which took about 10 weeks to erect, gave the watchman one of the best vantage points in eastern Washington County. The 1963 tower improvement project cost about $500. Cook, who was interviewed before his retirement in 1972, said he could see for 30 miles in all direction on clear days. He reported fires on Grand Manan and Deer Islands in New Brunswick during his 20-year career as tower watchman at Little's Mountain. The worst fires in the area, he said, occurred near Lubec in 1960, and at Centerville in 1965. 2005: The 60-foot Aermotor tower was dismantled, restored and erected on private property in Pennsylvania. 1920: Inventory indicates a 30-foot wood tower. 1949: A 60-foot steel tower with a 7x7 cab was constructed by the Maine Forest Service. August 28, 2012: Vandals ripped a safety rail from around the the entry hole in the cabin of the tower and tossed it to the ground last Sunday. This is the second case of vandalism reported this season. 1917: "Frank W. Hilton, Bingham, Chief Warden, Upper Kennebec Region: During the season we have built a new night camp on Bald Mountain for the watchman, which was badly needed. We have shortened the line from night camp to the lookout camp on this mountain. We have changed the telephone wire running from Lake Moxie to Bald Mountain, changing the trail and cutting bushes. 1920: Inventory shows a 36-foot wood tower. May 2012: The Maine Forest Service dismantled the tower, the structure will be restored and erected at the Ashland Logging Museum. July 7, 2013: Dedication ceremonies to be held for the reassembled Norway Bluff tower at the Ashland Logging Museum. 1913: This site was first established as a lookout station. 1920: Inventory shows a 36-foot steel tower. 1959: In the Fall the tower was abandoned, the duties taken up the following year at Speckled Mountain. 1959: Listed as an auxiliary lookout. 1916: The lookout was established. 1920: Inventory indicates no improvements. 1909: Listed as a lookout station in the 1910 Report of the Forest Commissioner. 1920: Inventory shows a 58-foot wood tower. 1918: The tower was completed. July 9, 1949: "The Sanford Department notified by the Ridley Hill lookout tower that a fire was sighted on the east side of the town found an Errol Street resident burning rubbish without a permit. Chief Allen said no permits are being issued during this dry period and all waste must be taken to the town incinerator. 1909: "On the Machias river the Ashland Company has a telephone line to Machias dam at the foot of Machias lake, in Township N0. 12, Range 12, from which point the state in 1909 built a line to Round Mountain fire station in Township No. 11, Range 8." 1918: A 48-foot steel tower was erected. 1941: The lookout site was established with a non-standard ground cabin. The use of the lookout was sporadic over the next decade. 1914: A wood structure built from logs. Operated by the New Hampshire Timber Owners Association. August 1919: A steel tower of approximately 40 foot with an 8 x 8 wood cab was constructed. The delivery of materials required manpower to pack to the summit. August 9, 1919: "Mr. Violette went as far on his recent trip as Grafton, where he looked after the work of erection of a lookout tower on Speckles mountain. This is a 36-foot steel structure of latest design and will be on one of the highest mountains in Maine and one of the hardest to climb. It has no roadways and every bit of the material entering into the construction of the tower has to be carried on the backs of men, a trip of about 2 1/2 hours duration, as this material weighs about 2600 pounds, it will mean some backaches. 1917: "R.L. Brick, Chesuncook, Chief Warden, Chesuncook section: The Mt. Spencer lookout station has been painted this year and glass put in same, also a wire screen used on the outside to prevent hail stones and large birds from breaking glass. 1920: Inventory shows a 14-foot wood tower. December 2009: The cab was removed from the tower. 1920: Inventory shows a 26-foot wood tower. 1920: A lookout was constructed. November 3, 1950: "A new lookout tower on Streaked Mountain in Hebron and Paris will be put into operation next spring to replace the tower formerly maintained on Bear Mountain in Hartford, according to Fred E. Holt, supervisor in the State Forest Service. The 34-foot tower on the highest (NW) point of Streaked Mountain, and the warden's cabin on the road to the tower are the structures on the mountain. The Forest Service plans construct a telephone line down the southwest side of the 1,770-foot mountain. The 34-foot high tower is reached by a trail which leaves the South Paris-Buckfield road on the northeast side of the mountain. Holt said the general range of coverage from the new tower is to hills surrounding Bethel, Rumford and New Sharon. Mt. Pisgah, 809 feet above sea level, in Winthrop is plainly visible from the site and the Camden hills are the first range of mountains seen beyond Pisgah tower. The cab atop the 34-foot tower is eight and a half feet square with about seven feet of head room. The steel work was purchased from Army surplus and was scheduled for an air field observation tower. The cab is wood construction and was prefabricated by Wilbur Libby, district State warden at the West Paris storehouse. All the tower construction was handled by Libby and his seasonal wardens. Construction of Mt. Pisgah tower in Winthrop last year and location of the new tower on Streaked Mountain make it unnecessary to maintain the Bear Mountain in Hartford at this time, Holt explained. He said the tower will be kept in repair, however, and will be used during emergency periods on a day-to-day basis. 2005: The former Frye Mountain tower was reassembled on the WMA. 1914: "The Forestry Department has erected a lookout tower on Three Brook Mountain, Township 15, Range 6, W.E.L.S., the same being of steel fifty feet from the ground to the portable house, which is seven feet square, having three windows on each side, thus giving the lookout watchman a clear view in all directions at all times. This tower is connected by telephone line (built by the state this season), with the sporting camps on Square Lake, thence private line with the settlement at Guerette and the town of Stockholm. December 17, 1926: "Commissioner Neil L. Violette announced yesterday that a crew under the supervision of Chief Warden Frank P. Conley of the Moosehead Lakes region commenced this week the hauling of steel and other material for the construction of the new 36 foot steel lookout tower on Wadleigh Mountain. 1911: "The total cost of the West Kennebago station was $190.34, there being paid for construction of the building, $45.20; furnishing and supplies, $131.07; telephone. August 3, 1925: "Gardiner friends have received interesting letters and snapshots from Mr. and Mrs. Lewis Blake, who are passing the summer at West Kennebago Mountain, Grants, where Mr. Blake is a state fire warden. They report that they are enjoying their summer very much and have seen many impressive sights. Looking out of the fire warden's tower they can see mountains in Canada, also in New Hampshire. May 18, 2012: The tower was removed. 1921: A steel tower was completed on White Cap Mountain. August 25, 1920: "Deputy Forestry Commissioner Neil L. Violette has returned from a trip to the western part of the State in the interests of the lookout service and reports that it has been decided by the department to erect a steel lookout station on Zircon mountain, which is on the dividing line between Milton Plantation and Peru. It is an elevation of 2240 feet and a station there will cover the greater part not covered by Pleasant mountain station, which is now being erected. This will make five lookout stations in organized towns in the western part of the State and these five will cover all that section. The view from Zircon mountain will reach to the station on Speckled mountain in Grafton, an unorganized township in the Maine Forestry District. (1) From the photo inventory of the Maine Historical Society.